The Film UR-MUSIG authored by Cyrill Schlaepfer is a musical journey into the remaining worlds of authentic and traditional Swiss folkmusic. It's unconventional form as a symphony of sounds, music, pictures and landscapes (soundscapes) caught the attention of the audience at it's successful premiere at the International Filmfestival Locarno 1993. After beeing showcased at many differnent Music- and Filmfestivals in Switzerland and abroad the award winning film UR-MUSIG got it's famous cult-reputation by continuous screening of more than 2 years in Zurich. The successfuly released original soundrack CD's: UR-MUSIG and UR-MUSIG Vol.2 are available through CSR Records. 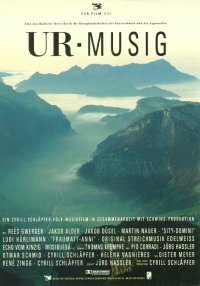 Ur-Musig with Rees Gwerder, Jakob Alder, Jakob Düsel, Dr Örgelidokter Martin Nauer, "Sity Domini", Ludi Hürlimann, Original Streichmusik Edelweiss, Echo vom Kinzig, Trio Mosibuebä a.o. 5.1 Dolby Digital Surround/ Bonustrack "Tell's Geschichte"